Since we seemed to have mastered counting to 10 recently (yes, the same little man that absolutely refused to count only months ago), I figured it was time we moved on and added a bit of a challenge and with our bumblebee unit still in full swing, it seemed like the perfect time to start counting some bees. Of course, we still practiced 1-10, but this time, we added 11-20 into these adorable bumblebee count and clip cards as well. I love these little cards for a couple of reasons. The first being that they portable! Take them with you anywhere! Grab a couple of Ziploc bags and take a set with you while you’re waiting at the doctor’s office or keep a set in the car in case you and the little ones get stuck in traffic. They make fantastic busy bags! 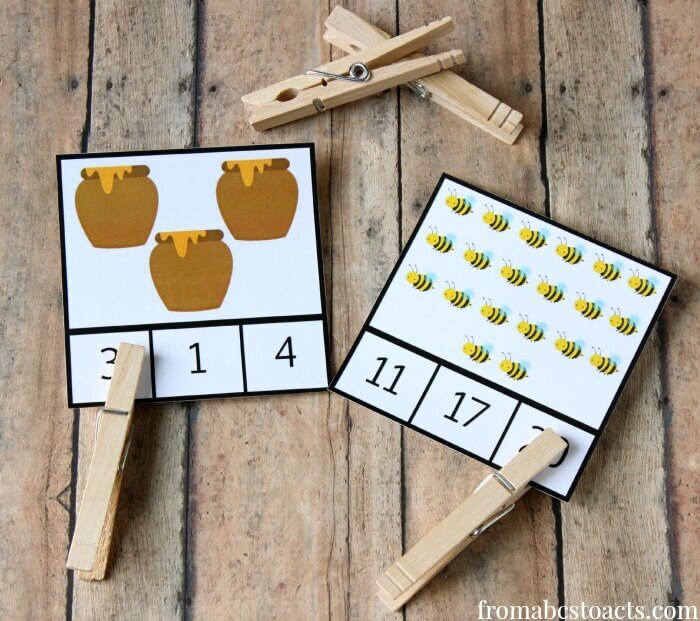 Included in the download you’ll find a printable card for every number from 1 to 20. If you’re using them with a younger child, just separate the cards and use 1-10 or 1-5. If your child is a bit older or already knows 1-10 well, just skip those and give 11-20 a try. All you need is the printable and a few clothespins!